I grew up in El Paso, Texas with my parents, four sisters and brother. My baby sister was born while I was a senior year in high school. It was around that time that I began to feel restless – a strong desire to explore the world. And that’s how I ended up in Rhode Island. My dream was to become a television Journalist. I knew as a teenager that the first step I had to take to fulfill that dream was one toward a higher education. I ended up at Providence College, and since PC did not have a Broadcast-Journalism major, I chose to be an English major. That exposed me to many talented writers on the PC campus who might have been my mentors had they been able to understand what it was like to be a Latina, a person of Latino heritage. That experience left me aware how important it is to have a Latino or Latina mentor to help get you through the day or offer a friendly shoulder to lean on. But it also showed me how to be persistent and my own advocate if I wanted to fulfill my dreams. An internship during my junior year in college gave me an opportunity to work in television, and it was then that I realized Broadcast Journalism was not the profession I wanted after all. From that I learned that working behind the scenes is more powerful. It taught me to take control and life is not a script to be handed to you by someone else. Back to that restlessness I felt that led me to where I am today. I remember someone once saying to me that Education is the key…” and as I think back, I realize that education became my key to calming the restlessness I felt as a teenager. It was my desire for an education that provided me a level of control, and it put me on the road to freedom ‐ freedom to choose, freedom to be. It was my desire for an education that gave me the opportunity to travel from the largest state in the U.S. to the smallest state in the Union. And it was after receiving my degree that sparked me to climb towards higher ground. Today I find any opportunity to mentor a young Latina or Latino, to support and encourage them reach their dreams. I believe in empowerment, that allowing someone to find him or herself is the greatest achievement one can fulfill. Life is not a script. Life is what you make it to be, but only after you’ve taken the steps toward to make your dreams a reality. Marta V. Martínez founded the Hispanic Heritage Committee of RI (HHCRI) in 1988 is now the executive director of Rhode Island Latino Arts. She is the founder and project director of the Latino Oral History Project of Rhode Island and is a member of the National Oral History Association, the National Storytellers Network, the American Folklife Society and on the Executive Committee of Latinos in Heritage Conservation @the National Trust for Historic Preservation. 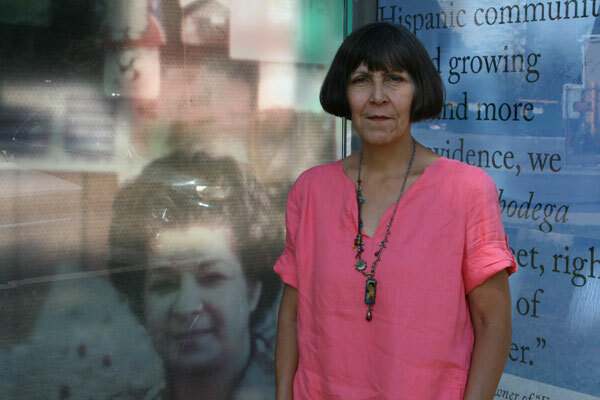 In August 2014, Martínez published a book entitled Latino History of RI: Nuestras Raíces, based on her work with the Latino oral history project. She promotes the importance of collecting history as a way to enhance self pride and a sense of place by offering workshops to young people on the art of collecting oral histories, pairing them with elders and individuals who have a story to tell. Martínez recently opened and manages La Galería del Pueblo | The Village Gallery, a Latino arts gallery and cultural hub. Martínez is a graduate of Providence College. She has a minor in Broadcast Journalism, a Masters degree in print Journalism from George Washington University and certificate of translation/interpretation from Georgetown University and also from Gallaudet University. She is adjunct professor at Providence College and a Humanities Fellow at Brown University; has taught at Central Falls High School and St. Peter’s Elementary School, Warwick.